Information » Registration and Pedigree » What is a Pedigree? A pedigree is a simple record of three generations of an animals heritage. Animals with unknown origin may be included on a pedigree and as future records are maintained for an animal’s offspring, a full pedigree will eventually be recorded. 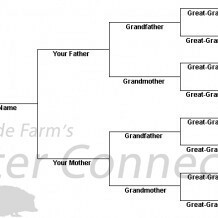 At Millermeade Farm’s Critter Connection, we keep pedigrees on every animal, but not all animals may have a full pedigree if some of the animals came from other breeders. A pedigree of an animal in itself does not guarantee the quality of that particular animal. Quality animals may not have a pedigree and poor quality animals may have a pedigree. A pedigree is simply the presence or absence of a piece of paper (or online record) of the animal’s lineage. A pedigree is a valuable asset allows one to track breeding stock and is essential in all good breeding programs.